Life can be quite stressful at times, but finding ways to unwind at the end of the day is vital! 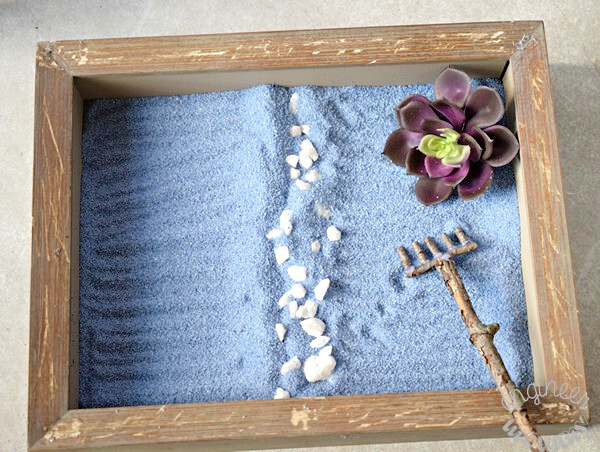 One of my favorite new ways to decompress is to play with my zen garden. 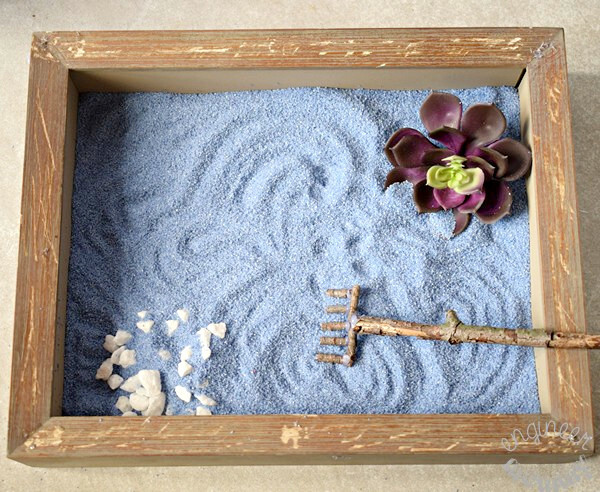 Today, I will show you how to make your own zen garden using a shadow box (or picture frame), sand, twigs and more. This zen garden really helps me meditate and mindfully get over any joint pains. Another effective solution that I discovered for chronic pain is taking Curamin® Extra Strength 60 count. I found this herbal formula at a local health food store and I’m loving the results! My joint pains came about shortly after giving birth to my second child. Most of my pain is in my hip and lower back. After numerous tests, it turns out that my sacroiliac joint (the joint that connects the pelvis and the spine) sometimes get inflamed. The pain can definitely be severe at times. I have tried many traditional medications for pain relief, but I don’t like dealing with all the side effects. 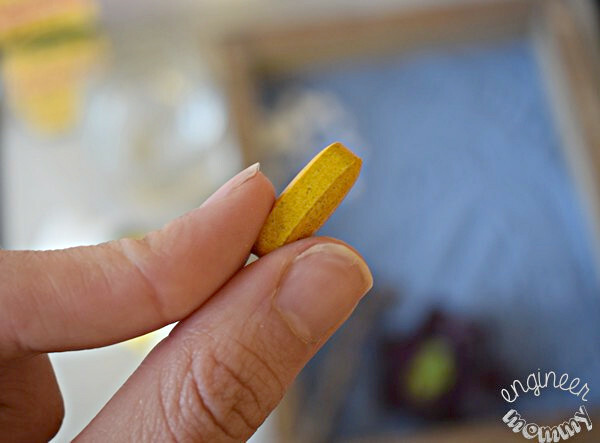 Recently, I discovered Curamin® Stop Pain Now and I love how this dietary supplement combats the pain without any of the traditional side effects of pain killers. 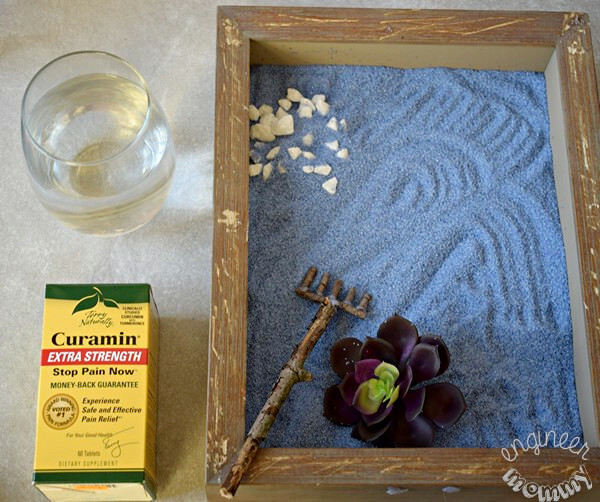 Before I tell you more about Curamin®, let me share the tutorial for my zen garden now. 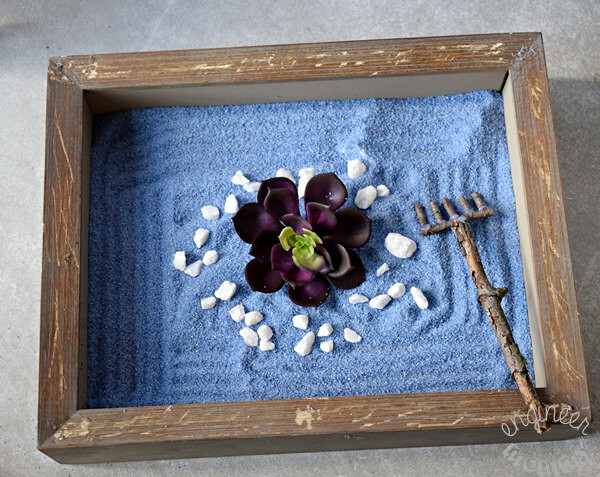 Start by filling the shadow box frame with the sand. I chose blue sand, but you can select natural (beige) sand or another color of your choice. 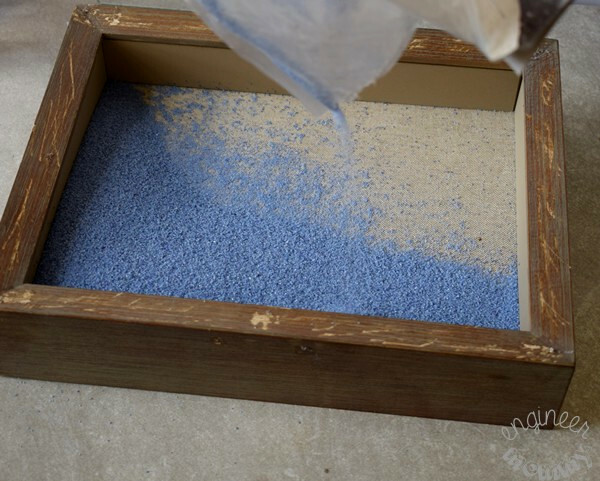 Shake the shadow box gently to evenly spread out the sand. 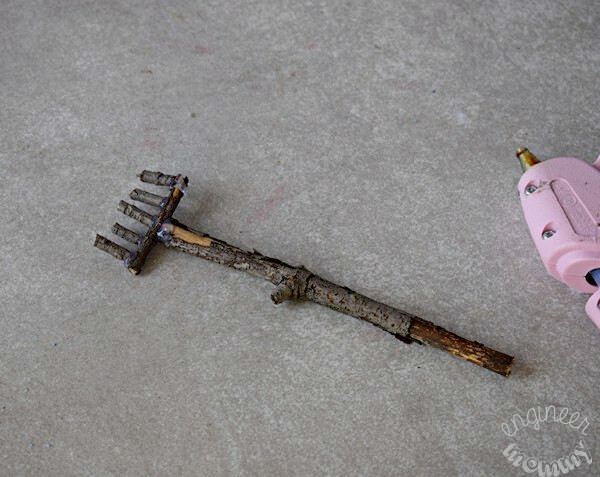 To prepare the rake for the zen garden, begin by gathering some twigs. We will want one long twig (~7″), one medium twig (~2″) and five short twigs (~0.5″). 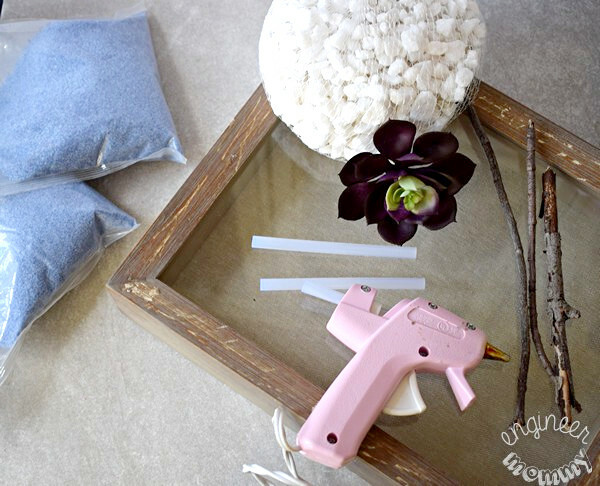 Use a pair of garden shears or craft scissors to trim the twigs to the appropriate sizes. Using the hot glue, attach the medium twig to the long twig at a perpendicular angle (see image below). 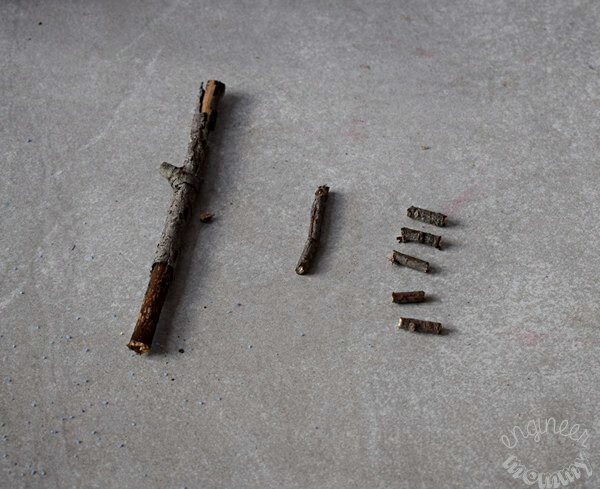 Once dry, use hot glue to attach the five short twigs to the medium twig. Now we have a rake for our zen garden. Now, it’s time to put it all together. Place the succulent in the corner of the shadow box. Place the rake down in the shadow box. Add the decorative white stones to the box. Begin dragging the rake through the sand to make an interesting pattern. It’s quite fun (and very relaxing) to move the succulent and stones around the box. Creating different designs is actually quite rewarding! 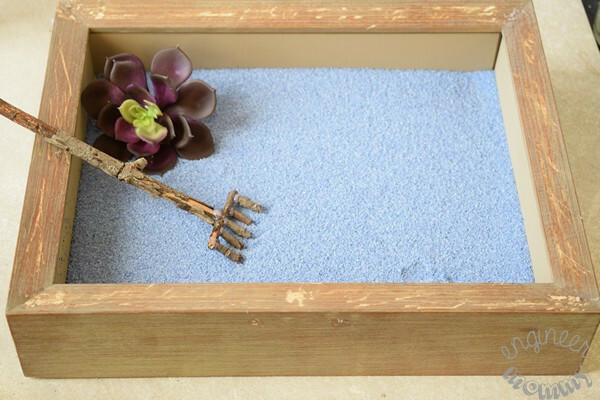 There’s something remarkably therapeutic about playing with this zen garden. 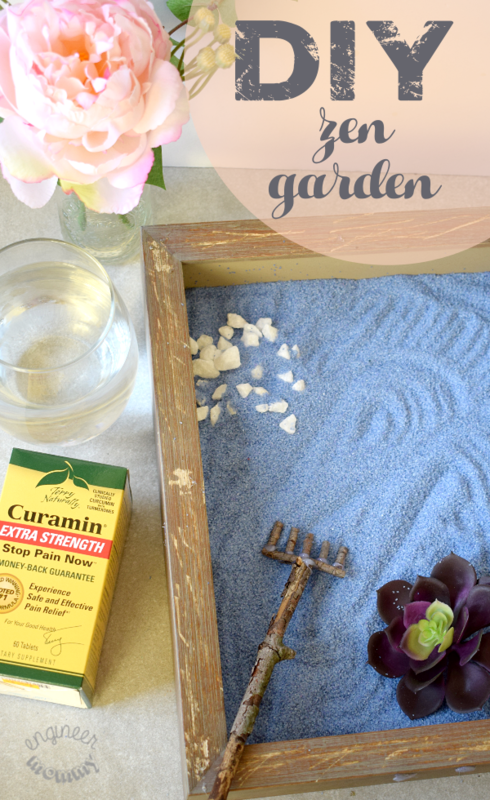 If you’ve never seen a zen garden, I urge you to make one. This garden totally encourages me to focus on a mindful existence and really being in the present. 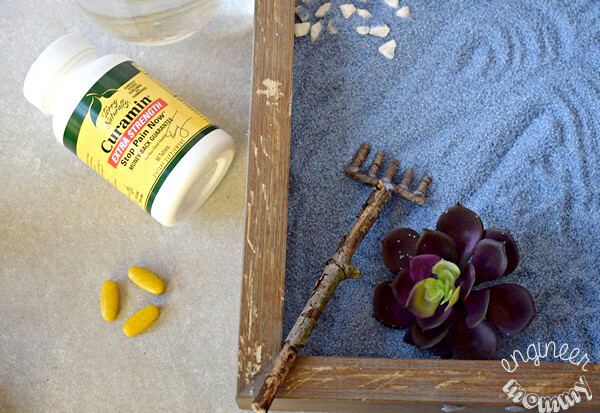 In addition to my zen garden, Curamin® is helping me overcome chronic pain and letting me live my life to the fullest. Whether that’s trying a new exercise class at the gym or chasing my kids at the playground, I refuse to be limited by joint pains! Curamin® is indeed a vital component of my well-being and peace of mind! Did you know that Curamin® has been voted #1 for Pain Relief (holder of 28 awards) and has been providing life-changing benefits for hundreds of thousands of people around the world? What’s important to know is that the ingredients in the formula have been clinically studied and are safe for pain relief! I really appreciate that Curamin® is safe, effective and non-addictive. Curamin® doesn’t just hide occasional pain. Instead, it stops pain at the source! The herbal formula in Curamin® is a dietary supplement and is very different from over-the-counter pain medications or prescription drugs. During my weekly trip to Whole Foods Market in Princeton, I picked up Curamin®, along with some of our household essentials. Don’t live near a Whole Foods? 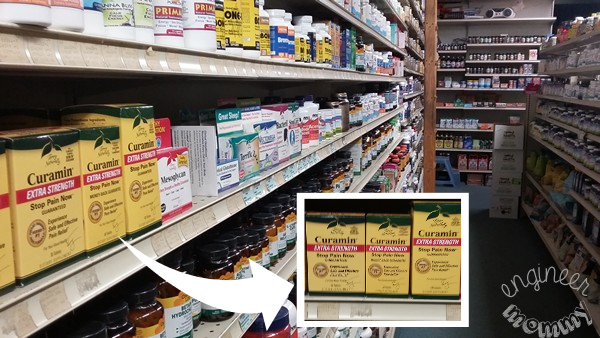 Don’t worry- look for Curamin® at fine health food stores throughout the country. When pain is the problem, see why Curamin® is the answer! Now, tell me: Have you ever dealt with chronic pain? 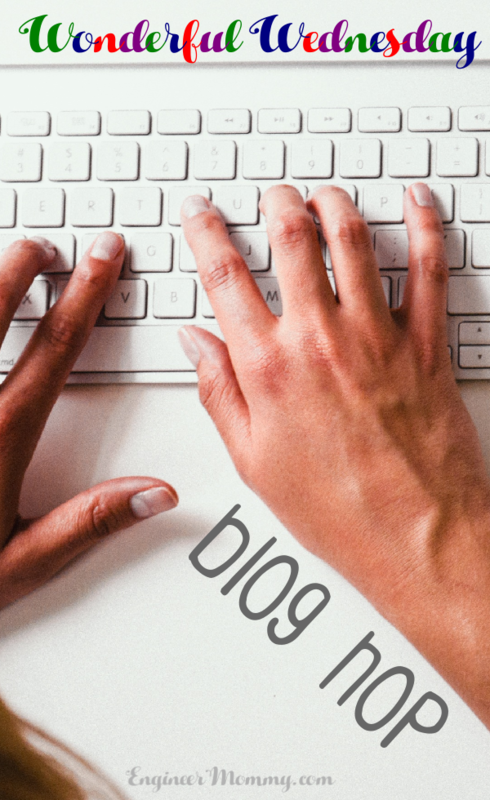 Do you incorporate a mindfulness into your everyday routine? How do you decompress at the end of the day? That is such a cute idea. I have never seen one of these gardens before, but now I totally want to run out and make one. It’s a really fun project! Let me know how your version turns out! Sand always sounds like a good idea when you read a post or see a picture. My dog would end up knocking this over which means a headache to clean up! I love DIYs. Creative and unique. Your zen garden looks awesome. I want to try making one too. Make one, too! It’s an easy DIY, Mars! What a great idea! I would love to have my own little zen garden in my office. I want to make one now. It’s a great addition to any office, Lisa! This is a great idea. I have a zen garden on my desk in the office and use it almost everyday. Have never thought to make one. I love it. Yes, I have always wanted one, too! I never realized how easy it was to make one of these little gardens! Ok, I need one of these. BADLY! Between stress at home and stress at work? I’m wound up as tight as can be. Doing something this relaxing would be amazing. I LOVE your zen garden. 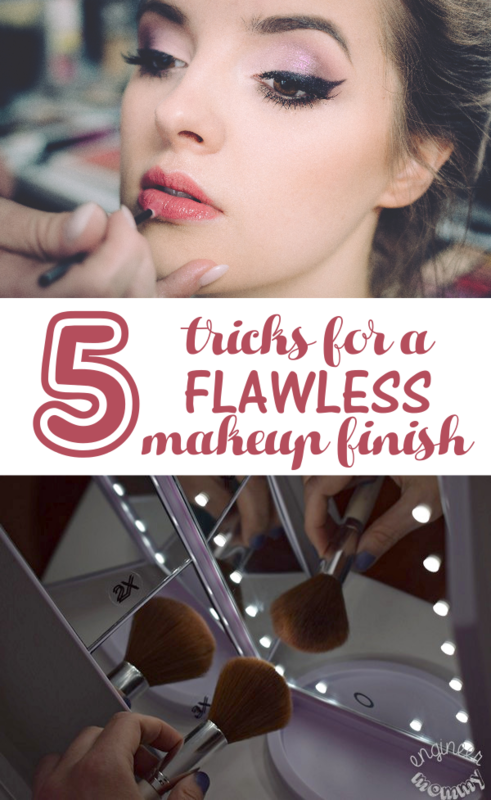 It looks a lot easier than I would’ve expected; something that a totally non-crafty person like me would be capable of doing! Thanks for the info about Curamin. I have fibromyalgia and deal with chronic pain constantly; this sounds like something that might help. I’m sorry to hear about your pain issues, Jamie. I hope you find some relief soon! 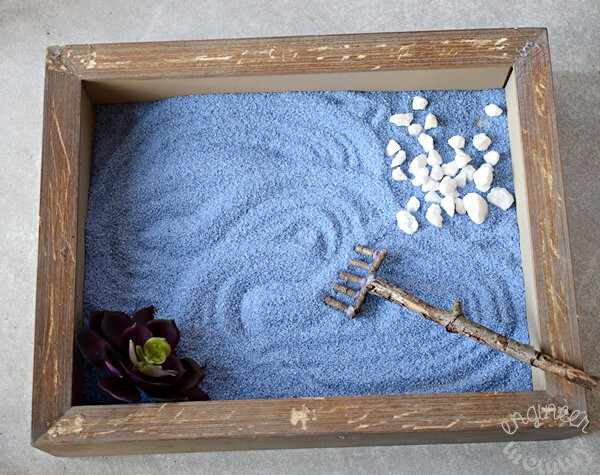 I am loving that DIY Zen garden. It is definitely relaxing to have that at home! Right now, things get pretty crazy and I always reach for a pain reliever to help me through my day. I will try Curamin. Maybe this will be more effective than the one I am currently taking. You did such a good job! You’ve convinced me to give this little DIY a shot! I really do like the zen garden here. It’s a very cool project and something that I feel like I could do. This looks so cool. I’ll have to try to make one. Make one. I’m sure you’ll enjoy it! I suppose that can be relaxing. My next door neighbor’s girls have fairy gardens in something similar. I could easily get carried away moving things around. My mind can get lost doing some of the most simple things. This one looks relaxing. That’s a cute zen garden.. I saw one made of salt, so cute! I need to try this product, looks good. The zen garden is very cute! Glad you are hopefully getting relief from your chronic pain with the zen garden and curamin Stopping by from Wonderful Wednesday. where do you get blue sand. All the beach’s I have been to are tan or whatever. 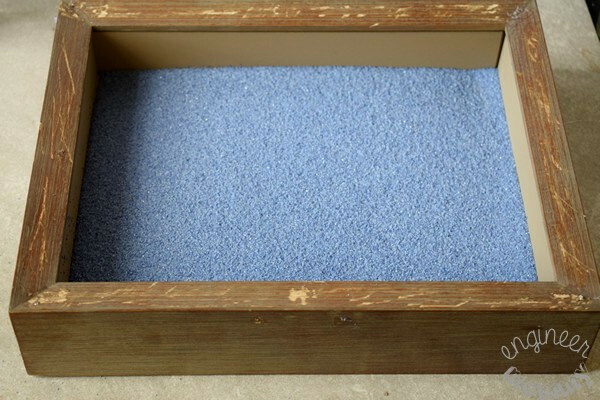 The blue sand is craft sand. Find it at craft stores, Dollar Tree, Walmart, etc. Thanks for your comment.